One year later: What do shoppers think of the Whole Foods-Amazon partnership in 2018? Our inboxes exploded this morning with news that Amazon will be purchasing Whole Foods for $13.7 billion. On receiving the news, Field Agent sprang into action with a quick, five-question survey of 300 Whole Foods shoppers. What, we wondered, do Whole Foods customers think about the acquisition? Do they expect to shop at Whole Foods more or less? What, if anything, do they hope Amazon changes about Whole Foods? How do they feel about Amazon's purchase? The results from this mobile survey are presented below as a five-question, Quick-Fire Q&A. Oh, by the way, yesterday we converged on all 10 brand new Lidl stores to capture photos, video, and shopper feedback from the retailer’s first full day in the United States. Check out our full video and shopper report from this exciting campaign! Quick-Fire Q&A: Are Whole Foods Shoppers Primed for Amazon? Field Agent first screened its panel of one million U.S. consumers to locate agents who shop at Whole Foods at least three times a month. We then targeted some of these agents with a five-question survey, which we ran for approximately five hours. 1. Do customers expect to shop at Whole Foods more or less after Amazon’s purchase? The majority (57%) doesn’t expect the acquisition to influence how much they shop at Whole Foods. Although only 7% said they’ll probably end up shopping less at Whole Foods, a healthy 36% said they expect to shop there more. Virtually no one said they’ll stop shopping at Whole Foods altogether. 2. Is there anything shoppers hope Amazon will change about Whole Foods? 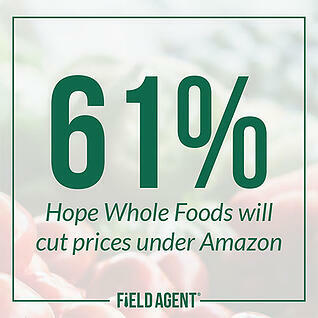 Perhaps not surprisingly, 61% are hoping to see a drop in everyday prices at Whole Foods following the Amazon purchase. Another 58% want to see more promotions, coupons, etc. Also among the top responses, 60% indicated they hope to see Amazon tie-ins—like, for example, discounts for Prime members. Notably, 47% want more digital services like curbside, home, and even drone delivery. 3. How do Whole Foods shoppers feel about the acquisition? Many are feeling pretty pensive about the whole ordeal. Field Agent presented respondents with 10 emojis—representing a broad range of emotions: happy, sad, angry, incredulous, shocked, etc. Fully 38% of respondents said they’re feeling primarily thoughtful, reflective, or pensive about the news, while 18% feel mostly happy and 10% shocked. 4. Do shoppers believe the company when it says it’ll stay true to the Whole Foods mission? We asked shoppers to what extent they believe this statement. Sixty-one percent said the statement is either completely or very believable. Only 7%, conversely, said the message is not very or not at all believable. 5. 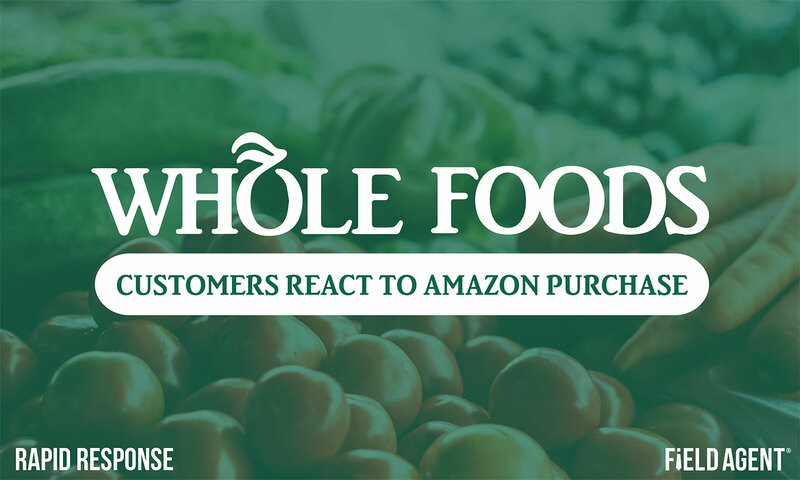 What are Whole Foods shoppers saying about the Amazon purchase? Don’t Miss Out: Subscribe Today! The Field Agent blog—Endcaps & Insights—regularly publishes intel from the forwardmost edge of the retail industry. Never miss a beat from the ever-changing world of retail. Subscribe today!